Listen, we love the outdoors. But the bugs in Florida are vicious and sometimes the wildlife likes to dip into the old camping pantry. This is to say, we enjoy experiencing the Burg’s campgrounds while still enjoying some tiny home comforts. What can we say, we want the best of both worlds — and one local company made it a reality. Tampa Bay Tiny Homes has solved an issue for reluctant campers: they’re bringing their Burg-made tiny homes direct to Ft. De Soto. The company has made a major splash in the state with their efficient, elegant home designs. Now, they’re nestled against palm trees in Ft. De Soto. 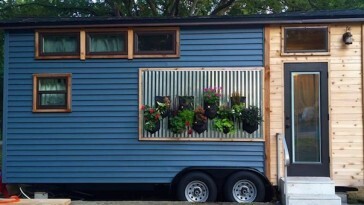 Who knows, maybe a taste of the tiny home life will make you consider downsizing. The tiny home rentals run around $250 per night. You can learn more about the rentals by visiting their website, or by calling 727.286.0934.